I think it’s great to set goals and work towards being a better you, especially when it comes to health and fitness. But how many of us have set unrealistic goals in the past, working like a madman/woman to stick to it for as long as possible, only to fizzle out by February 1st? And then feel like crap for ‘failing’? Booooo. That sounds like a maddening disaster. You know yourself best. If you need to quit something cold turkey, do it and stick to it. Remind your friends and family of your plans and ask for their support while you work towards your goal. Set yourself up for success in any way you can. If you need to take baby steps towards a more long term goal, then map out your plan and act accordingly so that you can get to that future point. Again, work on a support system so you can ask for help when you need it. And most importantly, remember that most things don’t happen overnight, so be patient and keep at it. The goal is to make lifestyle changes, not ‘I’ll work at it really hard for a few weeks and then quit’ type of changes. What are your thoughts on resolutions? Have you made any of your own? A few of my personal goals for 2014 include working more on my baking and getting Cave Girl Culture off the ground. Nothing has ever felt more right in my life than this blog, and sharing good food with people across the world. It’s been an amazing journey so far, and I’m pretty darn excited to see where this will go! Moving on to food, I made an amazing, energizing and clean breakfast/post workout meal today and had to share it with you. It’s pretty easy to put together which is a total win for people/athletes who are on the go. 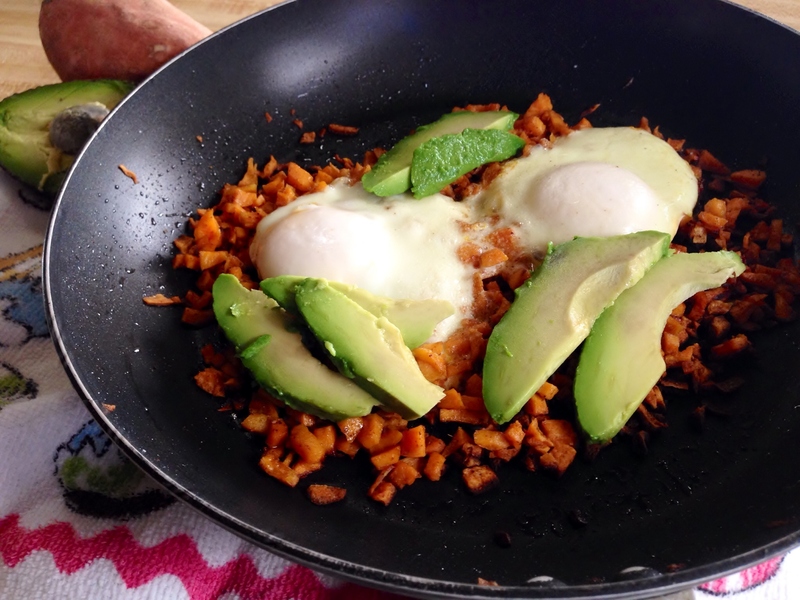 As you can see below, it’s pretty much a combo of all my paleo staples – eggs, sweet potato and avocado. I swear I eat a wider variety of foods, guys. Maybe I need to make a resolution about posting more variety of foods? Okay, I’ll work on it. In a large skillet, heat the coconut oil over low heat. 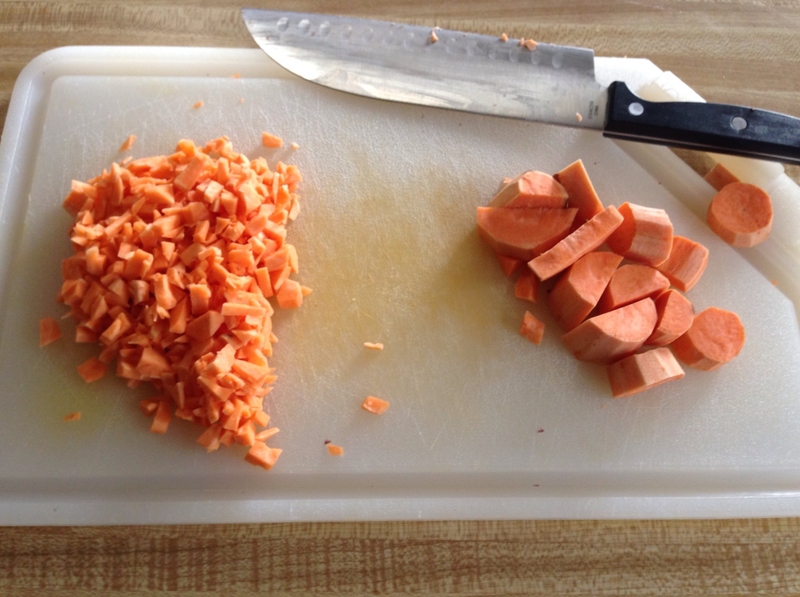 Prepare the sweet potato by skinning and dicing it into small pieces. 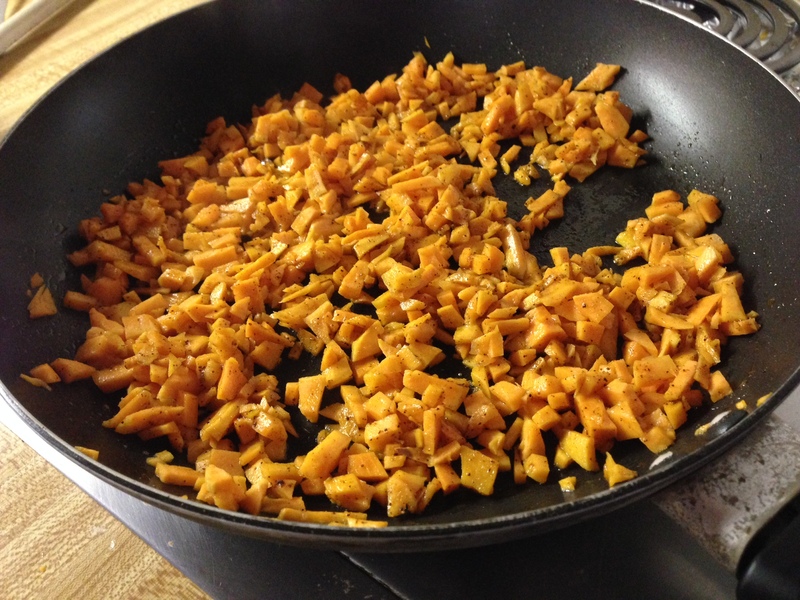 Add the salt, pepper, cumin and chili powder and stir the spices into the sweet potato. Cook this deliciousness a few minutes over medium heat, then cover and cook for two-three more minutes. Once the sweet potatoes have softened a bit, uncover and crack the eggs over the sweet potato and season with the garlic powder. 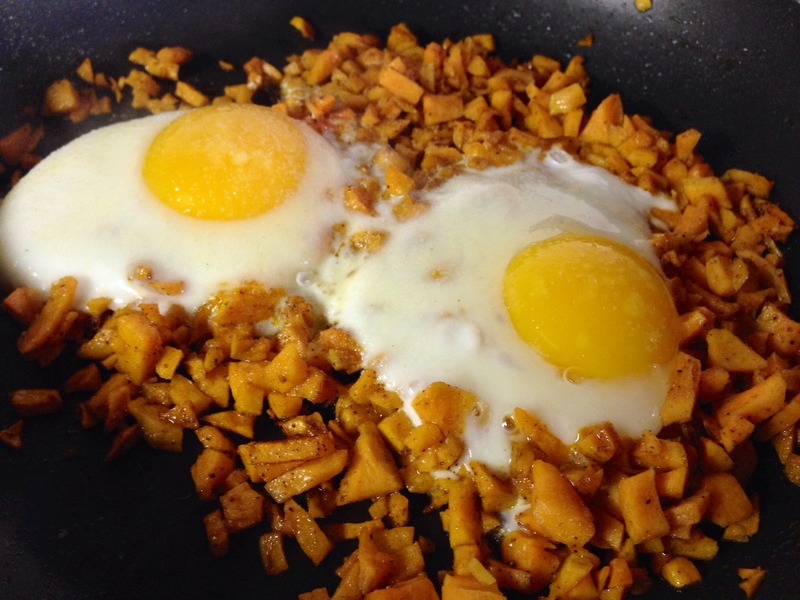 Continue to cook your hash and eggs until the eggs have cooked to your liking. Slice the avocado and add to your plate for a healthy dose of good fat. Okay, okay…last thing I want to share and it’s because it made me giggle. Call it humor appreciated from someone who is newly single.